I never knew that a “Duo Antakshari session” could create such a great impact on my mother.Defined as “silly and immature game”; it was yet another whimsical idea of mine to kill time on a Sunday evening. The whole plot staged almost a week ago when i asked my mom “shall we play?”. It was raining heavily outside, accompanied with loud thunders and as always, this time too she had advised me not to use either the T.V, computer or Cell phone (well, as is customary at home during thunder and lightning). But did I expect a “yes” to my naive invitation to play? Or did I expect an answer at all? I doubt.It was a question. And just that. The extreme dullness in the surrounding air had prompted me to go for such a crazy question. But to whom??? My mother? Having put forth such a weird question, i felt a bit sympathetic to myself. It isn’t the age to play-at least with your mom. “So here we go! I’ll start the game”- did I hear it wrong? No! I could see mom sitting in the opposite couch, facing me, all set to play. As always, this time too, she has surprised me – not just with a “yes” to my invitation, but with an additional stimulus to initiate the game. It must be her interest in the game, or the fond memories of her prime days, she was happy and excited! Fifty years had not made any significant differences in her. Neither another fifty could. Was it not the same energy and enthusiasm of a rebellious teenager, there was an extra ingredient that evidently made her a step ahead of me all through the game. She did win the game. A well deserved victory for a true game lover. But beyond the spirit of game, beyond the urge to win, the happiness in her eyes made me realize that I was never less than a real winner. It was the same glimmer that used to decorate papa’s eyes while seeing me at the arrival lounge of railway station. Such innocent glimmers are hard to find. Once found, they stay imprinted in our minds forever. I realize that time has flown quickly past me- making me grow beyond the safe boundaries of home. As life evolved into newer dimensions each day, I met heights, passion, obsession and materialism at various crossroads. Life did move on. Life did move away – from home, parents and those simplest of moments that brought sunshine to their faces. We are a generation with chains all around – chains of dreams to become big. Whether knowingly or not, it drags us away from the little shell called home; the mindless laughter and petty quarrels that define it; the joy , warmth and shelter that it can offer; the priceless value of relations. 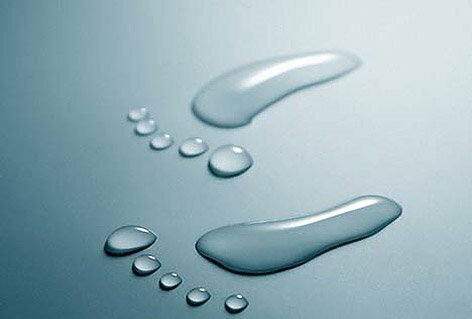 Perhaps, it’s time for us to opt for a journey down the hill – to realize that our stories and accomplishments rest upon those of our mothers and fathers- cemented strong upon the water of their lives. May be, years later, we would understand that those little streaks of sunshine we brought on their faces were the biggest of accomplishments that we have ever made in our lives. Dumbstruck I was initially! here I’m with my first blogging award!.. though I still doubt whether I truly deserve this one..
A million thanks to Pamela for the nomination.. 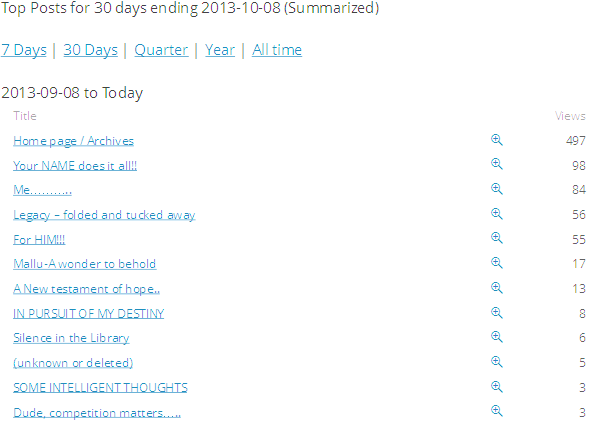 I must say, her Resonner’s blog had always been a personal favorite of mine. 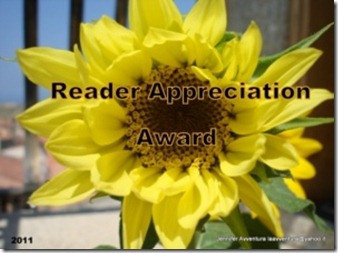 Identify and show appreciation of the blogger who awarded you.Add the award logo to your blog. Nominate 5-10 of your favorite bloggers for this award. Inform your nominees that you nominated them. So,here I’ m adhering to the rules as specified. 1. 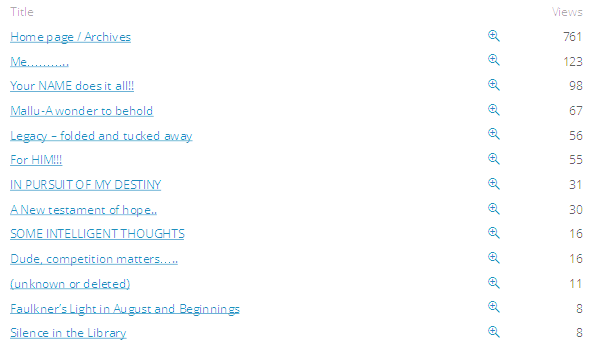 From where came most visits to my blog so far today? 2. 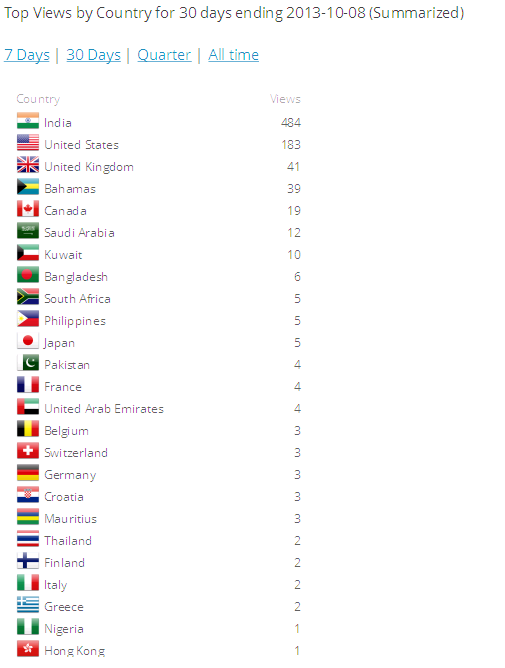 From where came most visits to my blog this month? 3. 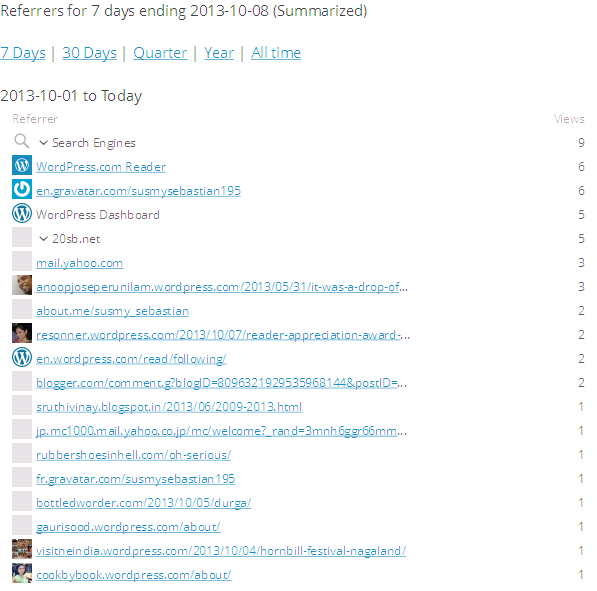 Which blog posts attracted most visits so far today? 4. Which blog posts attracted most visits this month? 5. Which blog posts attracted most comments recently? 6. What are the Comments statistics of my blog? 7. 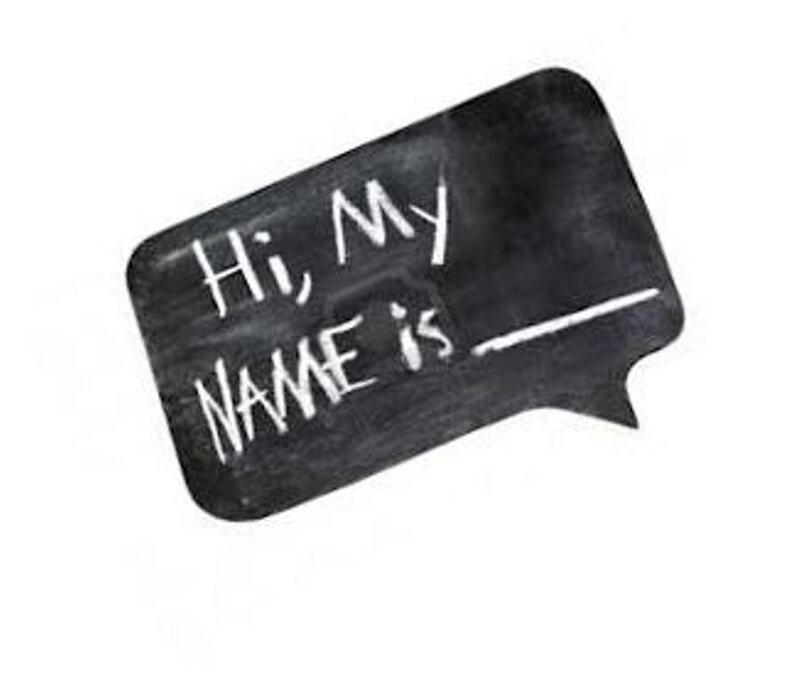 Which referrers referred most to my blog this week? And now, time for me to pay it forward!!! Words are few when the heart is full!! So, here I’m..Smiling!!!! Walking the everyday road of life, I’ve met him rather often. At times a rebel, an untimely visitor, a firebrand; at times a surprise, a blessing, a catalyst. I saw him knocking at my doorsteps at unexpected hours. I could sense his shadow growing and trailing behind me everyday. Just as anybody for that matter, stubborn I was initially to the transformations that he brought in, but comically defenseless when they hit me. No matter how hard I try, he continued to follow me. Devoid of an alternative, I finally opted to surrender. I was perplexed at his pace and wilderness initially; but with the passage of time,I could see myself growing bold and matured to face his pranks. Embracing the differences that he made in me, I continued to move ahead. This must be an epilogue of my story.A prologue of what lies ahead of me. He was good to me; he was kind enough. I know he has made me a different individual altogether. A New testament of hope.. Strapped to this office chair, my mind opts for a journey down the hill; all set for an introspection, seeking those faces and places that embellish the life’s canvas. World is best described as an ephemeral inn making us a mere spectator of the mass influx and exodus that happen quite monotonously. People come and go, and rarely a very few leave immortal impressions somewhere in the unknown corners of our heart. Love, happiness, sympathy, hatred, distress….emotions of multitude kind is what they gift us for a life time. Ever thought of the major rest who move past us, every single day? With anonymity taking the main lead, isn’t it true that the world is a hostile place to live in? Isn’t it paradoxical to call it a small world when we are still not very sure about our next door neighbor? Living in a much digitally aided, shrunken world, is it that we too have a much shrunken perspective? With distance no longer an obstruction to communication, they call it a world of better affinity and relations. Counted amongst the biggest of blessings is technology, the savior that lets relations a reality. But, having fallen a prey to masked intentions and prejudiced strategies, the savior often becomes an abuse. The humorous anomaly of living in a relational world that heeds no attention to relations makes me bewildered. Here being impressionistic is all what matters .It compels us to be self centered, completely unconcerned of those around us, their feelings and emotions and the endless list of our commitments towards them. Completely unaware of that very urge that planted these strange thoughts in me, I must say, it made me sit back, pause and ponder for a while. Though with a little pain, I realize, my commitments to the people around me, are not confined to, but invasive than what I could ever assume. Right from that unknown lady who nursed me as a newborn to that pantry boy who served me coffee a little while ago, my obligations are boundless. The list never ends anywhere; instead it grows enormously each second. The unstated but fundamental principal of human life lies in it’s inter dependent, inter linked and inter related nature. Imagine the plight of living all alone in this world, with none to offer you a helping hand, none to communicate, none to be with. It would have been just another place; devoid of love and harmony, brotherhood and peace. Suffused with war and materialism, it would make us blind to recognize our fellow beings. Perhaps it is because of the flooded thoughts; I can sense darkness all around me. 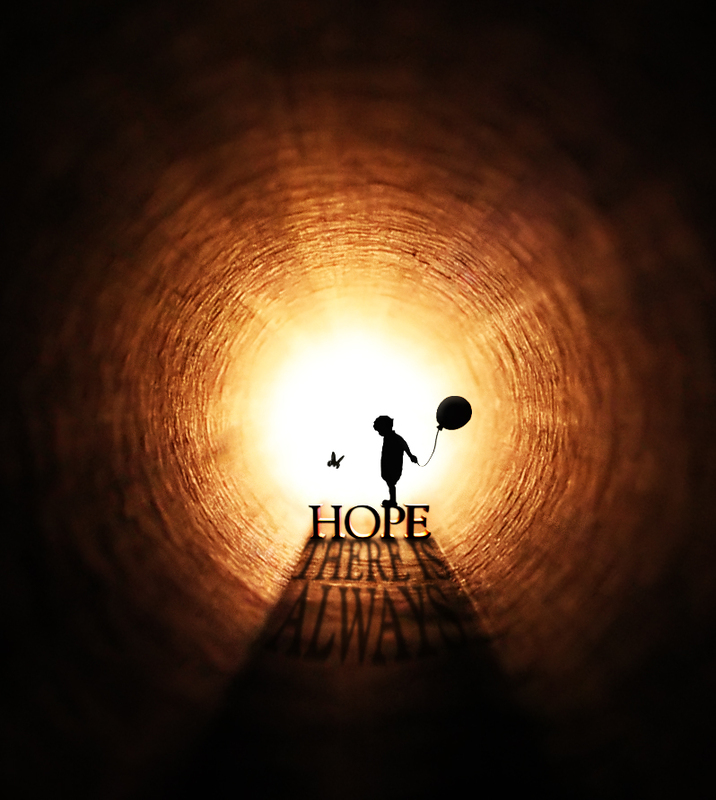 Aspiring for a little streak of light, what fills in my mind is a new testament of hope. As rightly said “Darkness cannot drive out darkness; only light can do that…Hate cannot drive out hate; only love can do that.” Together, let’s learn to value our relations and commitments. Together let’s be passionate to our fellow beings, let’s respect them for what they are. Together, let’s strive to make this world a better place to live in. Light awaits us at the other end of the tunnel.